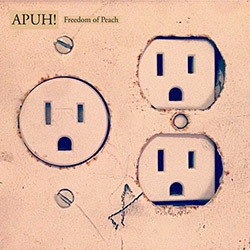 Great post-bop free playing from the Swedish trio Apuh! of Adrian Asling Sellius on saxophone, Hampus Ohman-Frolund on drums & percussion, and Mats Dimming on doublebass, recording in the studio in New York for 6 pieces that balance lyrical jazz with fully free improvisation, always captivating with adept playing and engaging approaches. Debut LP of the young Gothenburg, Sweden trio of saxophonist Adrian Asling Sellius, drummer Hampus Ohman-Frolund, and double bass player Matt Dimming, drawing on elements of pop and rock, klezmer, cinematic soundscapes, experimental noise, and free jazz.